20 October 2014: CambridgeIP with the University of Essex and the Institute of Engineering and Technology (The IET) will collaborate on a UK government-funded project. CambridgeIP, with the University of Essex and The IET, have been awarded a significant grant by Innovate UK, the UKâ€™s innovation agency, and the EPSRC to develop new algorithms and methods that will enable data explorers find relevant information from large corpuses of complex data. The end goal is to enable users to find relevant information more quickly in the growing sea of data and to provide users with tools to reproduce methods of finding information as the data landscape continually grows and evolves. 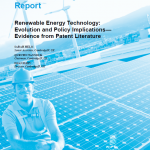 The World Intellectual Property Organization (WIPO) and CambridgeIP announced striking increases in commercial innovation, evidenced by patent filings, in key Climate Change Mitigation Technology (CCMT) areas: Biofuels, Solar Thermal, Solar PV and Wind Energy. CambridgeIP, with the University of Cambridge and Royal Society of Chemistry, have won a significant amount of funding to develop novel touch interfaces to CambridgeIPâ€™s global scientific literature archive. The end goal is to enable more intuitive search and analysis across multiple devices for both specialist and non-specialist users of patent and scientific literature. 13 February 2013: CambridgeIP today announced â€˜The Worldâ€™s Top 10 Graphene Patent Ownersâ€™, a commercial innovation league table for graphene. CambridgeIPâ€™s analysis of the densely populated graphene IP LandscapeÂ® is conducted on CambridgeIPâ€™s extensive global patent database, using CambridgeIPâ€™s proprietary search tools and patent analysis methods and enabling the development of this commercial innovation league table for graphene. 15 January 2013: Graphene patent applications surge around the world, especially in Asia. CambridgeIPâ€™s research into the graphene patent landscape and the views of our Chairman, Quentin Tannock, have been featured by the BBC (radio and online), by the Telegraph and elsewhere. CambridgeIP graphene patent landscape research for the period to 31st December 2012 shows a surge in graphene patent filings around the world from around 2007. In addition, 2012 experienced particularly high numbers of new graphene patent applications around the world, especially in Asian countries including China and South Korea. A new report from energy and water industry research firm Bloomberg New Energy Finance finds that technology innovation targeted toward waste water treatment from shale gas operations has escalated rapidly, with more than 300 patents filed in 2011 alone. The World Intellectual Property Organization has this month published a report authored by CambridgeIP examining the latest trends in innovation, technology ownership and geographical focus in the field of water treatment through membrane and UV technologies. 20 April, 2012:Â Graphene based technologies remain the focus of intense commercial R&D efforts by major corporations including Samsung, Sony and Nokia. In the four months since research for our last graphene report, major corporations, including IBM, Sony and Nokia; and major graphene Universities, including Manchester University, have accelerated the rate at which they make graphene patent applications. Leading players, including Samsung and Sungunkukwan University (SKKU) have maintained previous high levels of graphene patent activity.